Located in Upper Pinebrook, this handcrafted log home boasts massive Douglas Fir logs in an outstanding setting with a stream on the property. Easy main level living with large vaulted living room, open dining area and updated island kitchen. Large lookout loft perfect for office or family room. 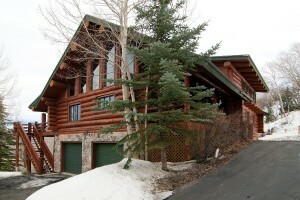 Main level master with 2-way fireplace, windows into the private treed setting and an updated ensuite bath. Walkout lower level with family room, 2 large BD and a brand new bathroom. 2 large decks offering either big valley and mountain views or privacy in the trees with plentiful wild life. New granite, appliances, hardware, lighting/plumbing fixtures in kitchen and baths in fall 2011. Offered at $729,000.